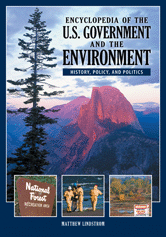 Encyclopedia of the U.S. Government and the Environment: History, Policy, and Politics explores the interaction between the federal government and environmental politics and policy throughout the nation's history. Wrtitten by scholars in the field and informed by the latest available research. Includes biographical sketches, chronology, and a bibliography of important books and essays on U.S. government environmental policy in print and on online.